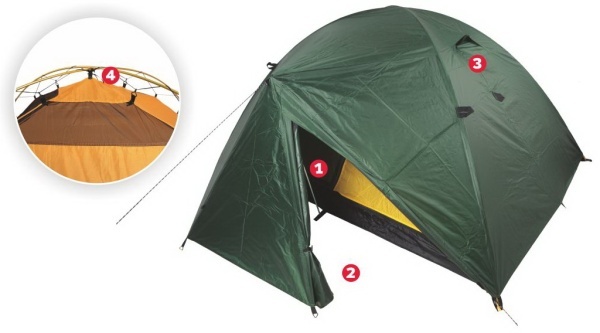 Light-weight one-entrance double-sheet four-man dome tent of a rectangular floor ground-plan with the large vestibule. It is suitable for heavier outdoor & alpine activities. The flysheet is put over the frame and attached to the poles ends. 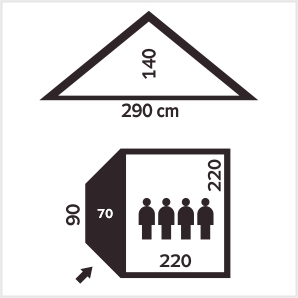 In front of the inner entrance the flysheet is prolong and forms the large vestibule which can be used both for storage of an equipment and for cooking (with caution). 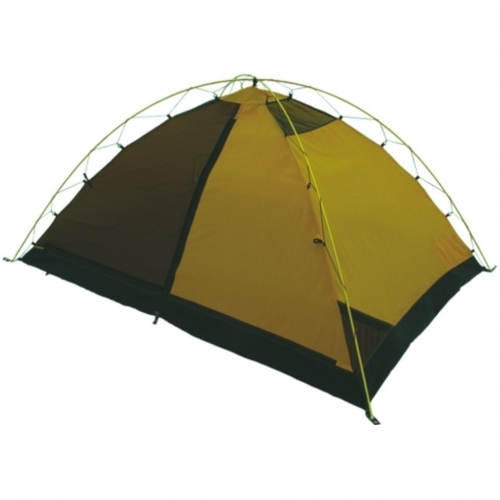 It is possible to guy a tent with help of numerous fixing points of flysheet. There are two air vents at the top of flysheet. Features: 1. Vestibule prop increases substantially wind stability. 2. Large vestibule which can be used even for cooking (with caution). 3. Well-tried protected vent. 4. Well-tried hanging of the inner tent with ropes and hooks makes set up easier. long Alu pole Ø 9,5 mm: 2 pcs. short Alu pole Ø 9,5 mm: 1 pcs.